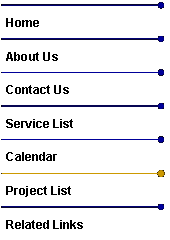 Music can be both - fun and cool! Every year there are many projects that come and go but here are some of the long term projects in my life. Anton joined The Duskers (then ‘Dusk Till Dawn’) in 1985. 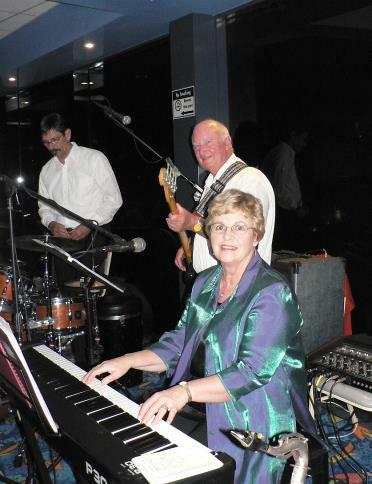 With the motto ’We Can Play Anything’ the band enjoyed success until recently while the members take a well earned hiatus. This band was FUN! 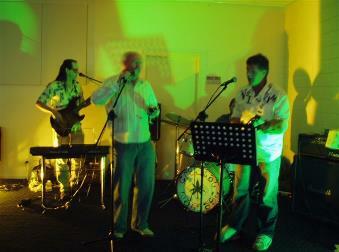 All band members sang lead and backing vocals and the repertoire grew with every live performance. It was against the rules to perform a gig and NOT play at least 2 new songs. It was also against the rules to rehearse as a band! The Duskers interacted well with their audiences, always encouraging requests. Versatility was the key to their success and their respect for each other musically. One night might be an Old Time Dance playing tunes written 100 years previously but the next night might be a Rock function playing the latest Triple J material plus anything in between — 40s Jazz, 50s Rock n Roll, 60s psychedelic, 70s disco, 80s, 90s Naughties Contemporary, Country, Reggae, Punk etc. Anton has enjoyed teaching hundreds of students through the higher education precincts of Monash University and TAFE College. 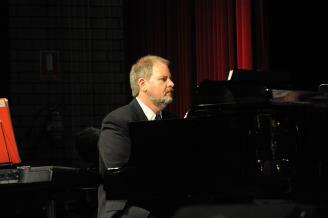 He has been part of the faculty of the Music Department at TAFE in Gippsland since its inception in 1990. The Music Department delivers the learning modules required for Certificate 2 in Music, Certificate 4 in Music Business and Performance and Advanced Diploma of Music. I couldn’t help adding this project to this page. 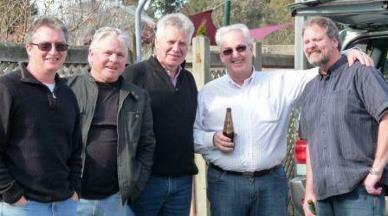 In May 2007 I celebrated a 30 year school reunion from my old school ‘St. Anne's and Gippsland Grammar School’ in Sale, Victoria. 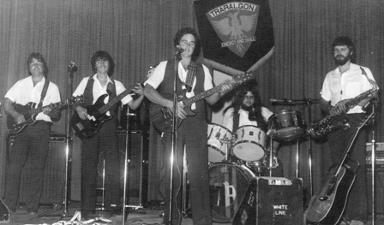 We were asked by the committee to revive the school’s rock group ‘Crystal Wattage’. So, 30 years after we last met, we got together to blast out a few of the old 70s tunes again. 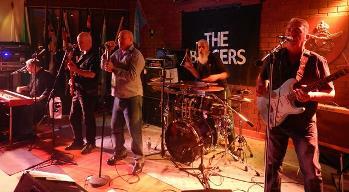 Pictured R to L: Roger Noden (guitar, vox), Anton Fullerton (drums, vox), Ian Needham (vox) and last minute fill-in Mel McMurrin, a professional vocalist from California (bass, vox). Also a pic of Anton on the same night on drums. 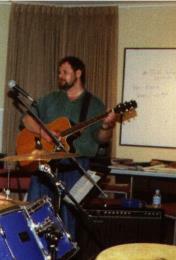 Anton Fullerton teaches privately from his studio in Traralgon. Many students learn for fun and many have gone on to make a career in music either as teachers or professional musicians. Students enjoy Anton’s passion for music and teaching. This picture was painted in oils for Anton by one of his former students Mandy Loechel and proudly adorns the wall of his teaching studio. By far, the best project in my life is my family - my wife Rachael and our two kids. The Luke Draper Band. I recently sat in for the live recording of talented young singer/songwriter Luke Draper for his DVD concert. With minimal rehearsal time, we performed about 20 of the songs off Luke’s previous CDs plus material from his upcoming CD to a packed audience at Traralgon Little Theatre. On stage were regular Luke Draper Band members Ben Tungst (bass) and Craig Wacker (drums) along with myself (keys), Clint Warner (guitar), Ben van Poppel (6 string elec violin), Max Thomas (percussion) and Steve Schulz (percussion). Recorded by Brett Tippet the DVD will be on sale soon. Film recorded in 1986. Some mates and I got together one weekend with a borrowed TV camera and my 8 track analogue tape recorder. We quickly put together a few tracks while also putting down a few beers. On the video is Geoff Machen (guitar), Chris Waterman (drums), David Timmers (bass), Steve Renfree (piano) and Anton Fullerton (vocals). Thanks to Nick Kohler for video production. Click on these links to YouTube for the tracks. Three wonderful big bands that I was playing piano with over the course of about 15 years. 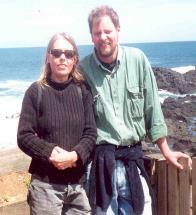 This pic was taken at Merimbula Jazz Festival around 1996. Margie and Tony Fullerton pictured here with their drummer Ken Vatcher. My parents were very encouraging with my music because they value their own musical life so much. Mum & Dad have always been the nucleus of many bands and have gained a reputation around Australia playing with many famous Australian and International artists. Here is a pic of my grandparents Iris and Ron Foale. Ron led his own dance band playing reeds from the 1930s to 1988. 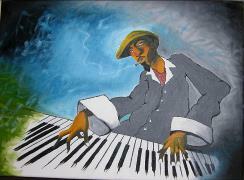 In 1980 he was invited to join Graeme Bell’s Jazz Band for the Breda Jazz Festival in the Netherlands. 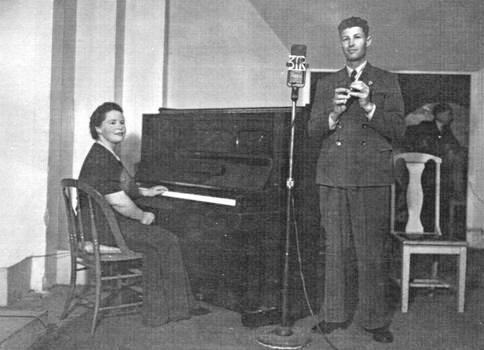 He received standing ovations regularly for his solo renditions of popular and classical songs on the halfpenny whistle. 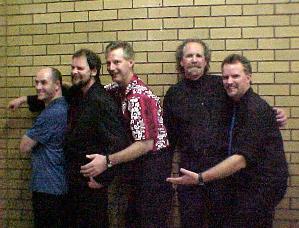 White Line was a successful and hard working band in the Gippsland region from 1979 to 1984. We were playing balls, debs, dances, sports club socials, weddings, parties etc. 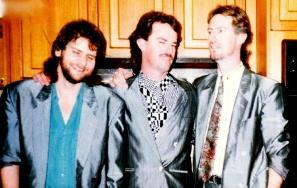 Here we got together for a BBQ, jam session and catch up 25 years on. L to R. Richard Teychenne (Bass), Max Warren (Guitar), Chris Stammers (Sax + Congas), Noel O’Doherty (Lead Vocals + Guitar) and Anton Fullerton (Drums). 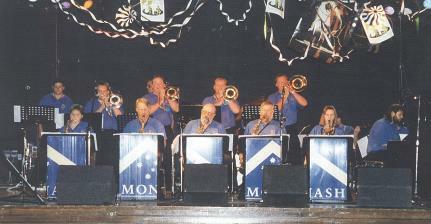 We formed a new Big Band but decided to downsize from 18 to 5 members. It’s easier to fit on stage! 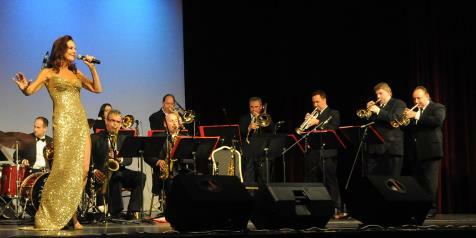 Playing a mixture of Be Bop and Standards. 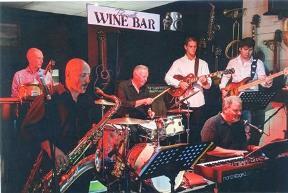 L to R. Anton (keys), Lionel Bailey (Tenor sax), Dave (drums), Bradley Cruikshank (horns) + John Hardiman (bass). 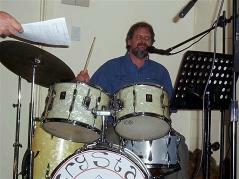 Regular drummer was Kathryn Stammers and fill in bassist Peter Howell. 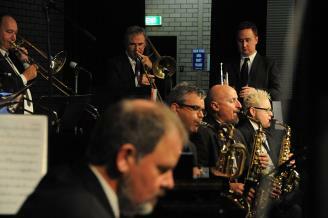 Formed another Big Band to play a private concert at Kernot Hall in Morwell in April 2012 under direction of Brad Cruikshank and featuring the dynamic Rhonda Burchmore on vocals and pizzazz! Rock n Roll band covering the hits of the 70s, 80s and 90s catering to the generation brought up watching Countdown. 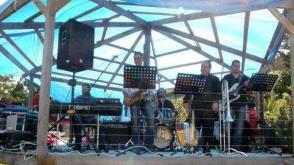 10 Piece ‘RnB’, Soul and Funk band. 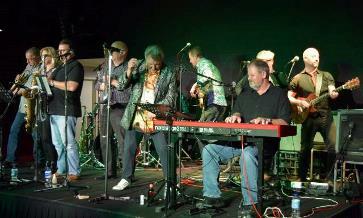 Having fun with old musician mates and sharing the stage with guest players each night we perform.